One of the things we're grateful for is the ability to produce and prepare our own food. We're thankful we can eat real food that hasn't been processed somewhere in a factory. Each summer my wife spends many hours canning peaches (which we buy from an organic producer in the Okanagan), canning plums (from our orchard), canning tomatoes (again, organic), making and canning applesauce (also from the orchard), making sauerkraut (that's a new one for her), making jam (remember to use organic sugar, everything else is GMO), canning her own cucumber relish, and more. 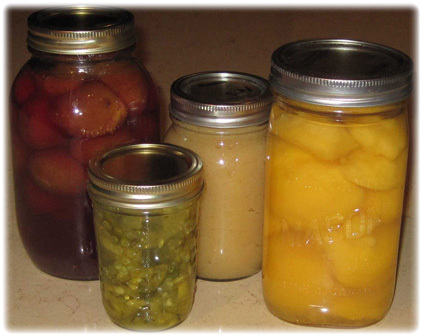 My wife's plums, relish, applesauce and peaches. She also spends hours in the garden, growing and harvesting carrots and potatoes and cabbages and squash and probably a dozen other types of vegetables. And then when she's done that, she spends more hours buying and freezing locally-produced organic blueberries, strawberries and raspberries. And that's not all. Time-consuming? Extremely. And expensive too. Most mornings we have our own eggs for breakfast (cooked in lard you know), sausages from our own pigs or beef, and some kind of frozen berries or canned fruit from the previous summer. Or, some mornings we have oat groats (overnight in a thermos is the easiest) which we source from a local organic supplier --- with maple syrup from our own trees. Alongside this joyful meal, we drink apple juice from our own apples (frozen from the previous season --- so thick you almost need to water it down --- nothing like store-bought). 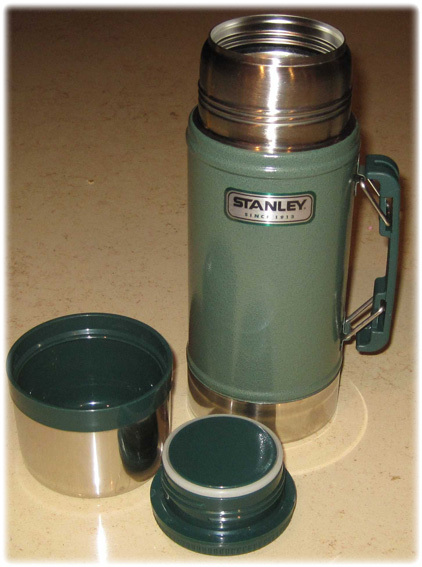 Our oat-groats thermos. Wide mouth is best. And most evenings we sit down to a dinner that my wife has prepared which is always our own beef, chicken or pork, and often several things she's produced from the garden depending on the season. Where am I going with this? Ten years ago we didn't grow any of our own food. Yes we bought organic, but much of our food was sourced from the grocery store and a hefty portion was processed. We had no clue how to run a farm, raise livestock, or grow fruits and vegetables. And that's one of the many reasons we're so grateful to be able to do these things today. The next time you buy something processed, you can see whether any of these items are listed on the ingredients. Chances are, it will have at least one of these (unless you buy a 100% organic processed food). 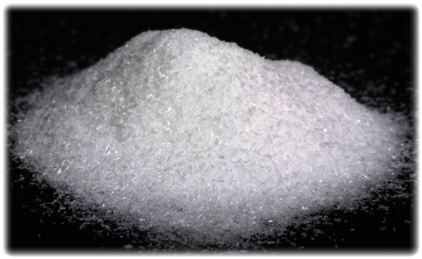 MSG --- often "hidden" in the list of ingredients by calling it something else. Source: Wikimedia. But it's not just about MSG, as bad as that is. It's also not just about avoiding Roundup and other agri-chemicals, as urgent as that is. It's about much more than that. I know for many of you reading this, the idea of growing and canning and freezing home-grown or organic local food might be difficult or impossible. But if you can, the benefits are so worth it. So I'm writing this to encourage you, and to thank you. Thank you for buying your food from local, organic producers like us. Thank you for making the sacrifices to pay for it --- we know it costs extra. And be encouraged, because there are more people every day who are realizing that the food we buy, produce and prepare affects almost everything --- either for good or evil.